The Avengers is a group of Marvel Comics superheroes that made a giant leap to the big screen. You can now find countless Avengers merchandise products that can’t be missing from any serious fan’s collection. Besides, they’re the perfect gifts to impress that friend who is always raving about superheroes. You’ll see what a hit these products are! What will you find in this section of The Avengers gifts? Browse incredible Iron Man and Captain America mugs, superhero t-shirts, Thor keyrings, trivia games, Funko Pop Avengers figures, backpacks, an incredible jacket featuring Marvel superhero logos, pyjamas, hoodies, trousers, beanie hats and much more… As you can see, there is no shortage of gift options and ideas in this Avengers merchandise section. You’ll have plenty of options for treating a friend, or yourself, to a cool gift…because you deserve it! Includes: Set of 50 trivia cards (in English). 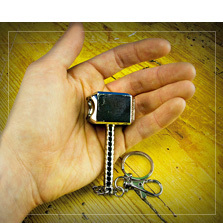 Discover the most original Avengers merchandise! Whatever your favorite superhero is, browse our Avengers gift section so you can find the ideal one. 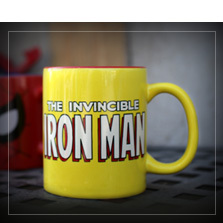 If you’re a Hulk fan, check out these original mugs, t-shirts and Funko Pop figures. 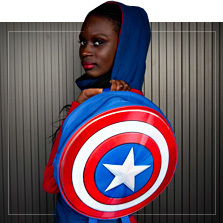 Or, if you’re all about Captain America, we have the perfect Avengers merchandise for you or that special geeky friend. Mugs, t-shirts, keyrings and caps can now be part of your awesome collection. Find everything you can think of in this section, where Marvel superheroes are the protagonists.